It’s just before a quarter to seven in the morning; the temperature is over 250 C and the sky is streaked with pink, purple and orange clouds. It should be autumn, but it’s still summer. Waking to a temperature that exceeds the normal average maximum for the time of year is not the best way to start the day. Tea may sluice away some of the nights disturbance, but it does not make up for lost sleep. The roads are quiet even for this time of the morning. Most people are still asleep in what passes for the cool of the morning. I drive past a few houses where people stand in their gardens and, shaking their heads, look up the sky. Another week will have to slip by before we see temperatures in the teens, before sleep is cool and refreshing. The flags on the Westgate Bridge hang limp and unmoving as the sun burns away the cloud and sky turns from pale to bright. For me, it’s a well-worn path to the east, towards Queenscliff, towards a day on the bay. I read the road signs, formal and informal, homemade and manufactured. Voices from the radio talk about climate change and weather. People phone in to complain about bias. Its 280 C at 7.30 am. I wonder if they have noticed, or whether they are buried under todays Australian, that calls for business as usual and supports the protestations of an English Lord who (unfortunately) shares my name. I concentrate on the road; and smile at the found poetry of the painted signs. Keep Left, Keep Right, Keep Going. There are very few people in the car park at Queenscliff. This select few, this band of birders, are pulling on old shoes, battered hats and buff coloured clothes. The birds they watch are always better dressed than the watchers – even if the birds are in deep moult. The air smells of sun block, insect replant and coffee. Wafts of bacon drift from the harbour side cafes. It still feels early and it feels hot. I look at my bag and decide to take less food and more water. The boat is sleek and pointy – comfortable seats and some shade. A rushing tide and contrary wind ruff up sharp waves in the Bay. We go away from our destination to avoid the chop. Wind and waves conspire to kick sprays of water over the edge of the boat. If you want to look forward you need to keep one eye shut. A few hats are dislodged, a few people dampened. We swing off our distancing tack and head for Mud Islands, over water less than one meter deep. It’s strange to feel all at sea, but know you could jump overboard and still stand with you head above water. If there was ever an experience to show how much difference a change in sea level would cause it has to be this. Australia is old enough for people to have watched as these shallows flooded grasslands and turned the land to sea. Who knows if early Australians had the same mental myth of climate permanence as we do (did? ), but to watch the land became the sea, the solid become fluid, must have cut away at what they knew to be true. The islands are not that impressive from the sea – in fact they are almost invisible. They don’t have the height to break the skyline of the shore and so merge into the background. It’s only when you wade ashore – through ankle deep water – that they take on the form of real islands. The highest point on the island becomes you own head and from that vantage point you can look down to sea, land and now a distant horizon. And, despite the islands name, a lack of mud. The beaches are squint-eyed bright under the cloudless sky. 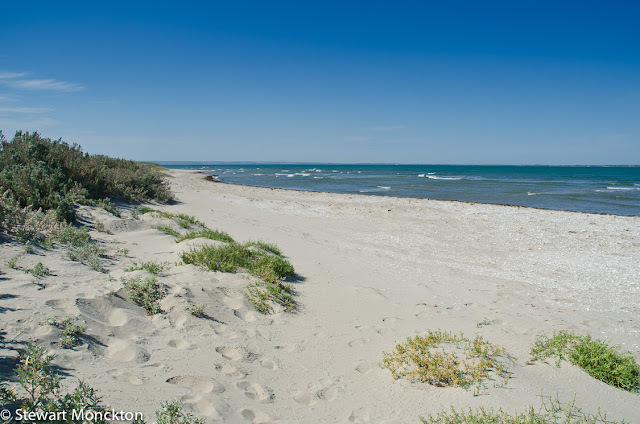 A mixture of white sand and shells brings a sense of tropicalilty to these normally cooler beaches. Welcome swallows flash over the sand, and groups seems to hover over the clumps of low plants that stud the upper beach. Once you touch a plant its not hard to see why – swarms of small blue butterflies spring from the vegetation when ever it moves. A wind shock or a footstep releases them and the swallows dive and dine. Once the butterflies land again they almost disappear, their underwings a counterfeit of a leaf or a dried stem. The point of arrival is unremarkable except for two bright orange buoys floating just off shore that mark both the beginning and end of a circular walk. The choice of pale clothes and old shoes is validated as soon as we start to walk. The sun above and the reflections from below are harshly bright. It feels good to wade through the water when needed, and it happens frequently enough for you feet never to gain that almost dry feeling that is far more annoying that simple wet feet. A few people change shoes constantly between a dry pair and a wet pair. These people balance on one leg and wobble in the wind. The waders on the rocks seem to have the one legged standing routine better organised than the people. I am reminded of and adapt the words of my brother: wet feet are only a problem if you assume you can keep them dry in the first place. Water bottles are hidden in the bushes, not for fear of thievery, but to gain some shade and the promise (or hope) of cool water on our return to this point later in the day. 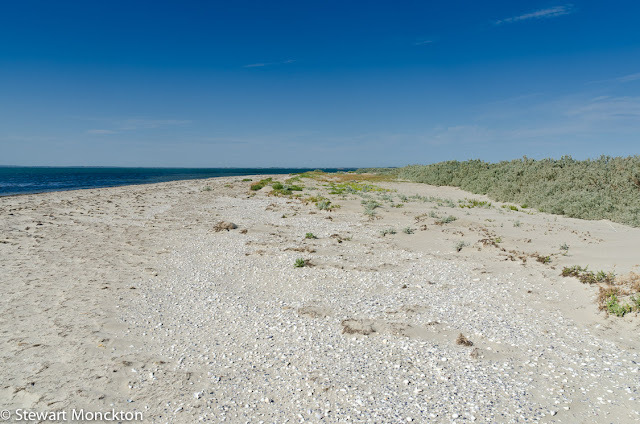 We start to walk around the island – clockwise or so it seems from our starting point. White gulls hang over the white beach, white waders – stilts – fly low over the gentle wave breaks just off shore. Every thing is bright and clear. The group of island walkers pick up bags and rucksacks, pull on straps and open and shut Velcro fasteners. Fine-tuning complete we walk on. At what feels like a corner on a circle a mixed flock of waders gather to roost. Beak to the wind, tail feathers gently flickering they wait for the turning of the tide. Long beaks, medium beaks, long legs short legs. Mud probers, stone flickers. Large birds, tiny birds. 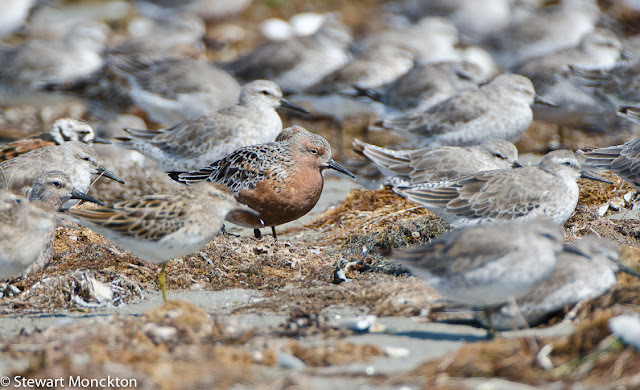 As we slide slowly into an autumn that should already be here, a Red Knot is putting on its spring clothes. Getting ready for a long flight north and a breeding party on arrival. Most of the others of his kind are still dressed in the dull functionality of their work clothes. No party suit for them yet. A few Sharp-tailed sandpipers – sharpies - are starting to get dressed up, as are a few Godwit. It seems a shame that they put on their showy breeding finery just to leave, and return in the drab colours of camouflage and safety. I settle at the back of the walking group and sit down. 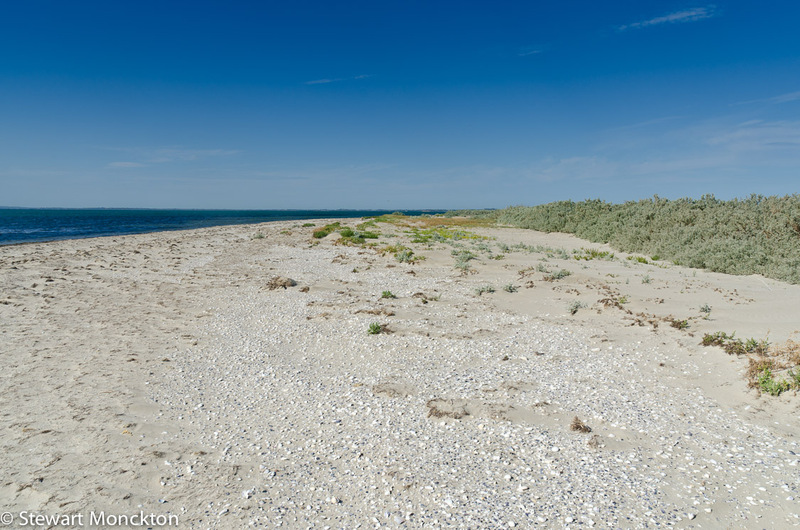 Moving my tripod a metre at a time, I bum-shuffle down the beach, edging closer to the birds. I end up with my feet in the water, a very wet bum and pictures I am pleased with. That’s a fair trade. Overhead the small white birds are not gulls. They distract me from the waders as they land, just a little out of lens range, on an open sand bar. 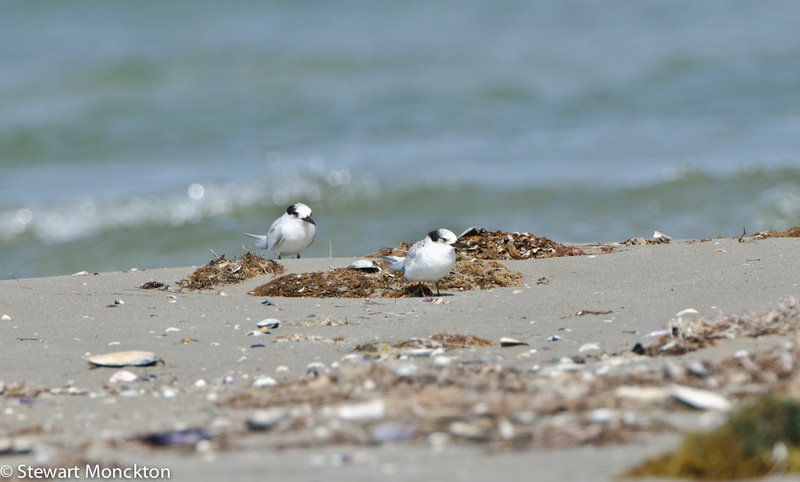 They are terns, but the question becomes what sort? They are very small, with pale legs and dark bills. Fairy Tern? Little Tern? Or the as yet undescribed hybrid The Tiny Tern! As ever these birds seem to have a combination of the features of both birds. And it does not help that I can see (or think I can see!) both species in the air over my head. The ID of this bird becomes a Bridge Too Far. I plan to consult my photographs when I get home in the hope of finding an answer – optimism never goes amiss. The prospect of lunch hangs heavy in the air as we walk along a creek edge. Pushing into the middle of the island, this creek splits the mud in two, hence the plural name – Mud Islands, rather than Mud Island. Sitting on the edge of a salt marsh, rich with halophyte Salicornia, Sausage shaped bulbous plants, ripe for the bursting by little fingers, we are overflown by pelicans and ibis. Egrets stab at fleeting targets and Buff Banded rails do a passable impression of chickens. I nibble on an apple, doing a passable impression of a rodent. The lunch ground smells of coffee, cheese sandwiches and the unmistakable aroma of warm chocolate. Soft mud, the first we have found, oozes over the top of my shoes as we wade across the creek. Dozens of small fish, the revealed target of the egret’s beak, flick away from my churning feet. The water is warm and clear. Life abounds. Bigger fish break through the surface and a few crabs sidestep the issue in holes and under rocks. Life is abundant as we enter a graveyard. It the proper season the Islands are home to a colony of pelicans. The birds raise their graceless chicks on nests of sun-bleached sticks, edged with sea cast weed. But now the colony belongs to the dead. Broken birds lie is slight, fractured disarray. Desiccated beyond putrefaction, there no smell beyond that of salt and dust dry sand. 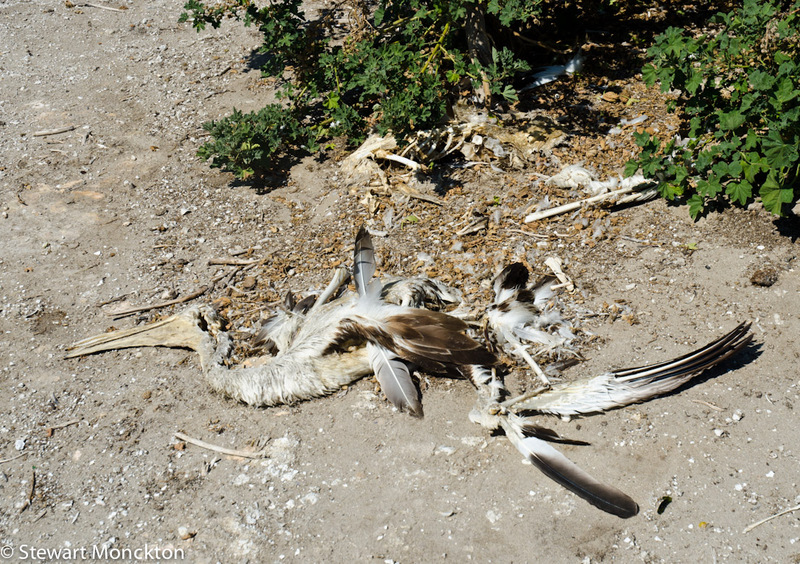 They look like feather rags and bones. Some died in the nest where there bones join the sticks and their feathers flicker, catching the breeze, a memory of the life potion that failed. Some died under bushes, maybe seeking protection from the afternoon sun, maybe hoping for some hint of warmth and shelter on a chill night. The economy of over production, safety in numbers, selection in action. The weak, the failing or badly built, abandoned by genetics. The unfortunate, abandoned by chance. But all left behind by the ones who did not die. Those who passed the test and remain part of the DNA river that flows, generation to generation, away from the first cells, away from the well spring of life, branching as new species form. It’s a site filled with brutal honesty, a clear lesson about the nature of the real. To see such things is to be reminded of our place in the world. We walk till we find the paired orange buoys, the hidden drink bottles and a boat to take us home. So many beautiful photos! Sad to see the pelican though. Sounds like a fascinating trip. Enjoyed your photos and your story. sigh, wonderful Stewart; I was there with you and could almost smell the salt. This is making me a tad homesick - but don't envy you the incredible weather you've had. Peculiar that the North end is enduring the longest cold and snow spell by comparison. Your observations re 'permanence' and our place within it are valid and insightful. What a beautiful place to wander around and snap photos! I visited a pelican colony in Florida a few years ago and got some once-in-a-lifetime photos there. Pelicans are beautiful creatures. Heck - all birds are! Hi Stewart!I enjoyed your photos and your story! !Very beautiful place!Wonderful pictures! !Happy Easter to you and your family! Love reading about your day and your insight into the world around us, in many directions. As always, I thoroughly enjoyed this day in the life of Stewart M.
That sounds terribly fun:) Oh I can imagine how much I would sweat:) But all those birds......nicely captured on your camera. Looks like a fun adventure. Stewart...It is apparent that you do pay attention...and express yourself very well...both with camera and pen!. What a beautiful place to explore, Stewart. Love the first photo of the line of birds. Perfect poses! Well, I quite enjoyed the heat of the early morning and the "highway haiku" of signs. The boat ride was refreshing with the salt spray hitting my face. The time spent photographing the birds expired all too quickly. I am not ready to board the boat to leave Mud Islands yet. Stewart, thank you so much for a memorable trip! ...I was transported by the magic of your words. I thoroughly enjoyed this. Thanks for directing me here. I read this a while ago on my IPAD, but it's hard for me to comment using it..just remembered to come by again! I am not a fan of mud, but your story/essay made me think I'd enjoy this place. Wet feet are OK if it's not cold. 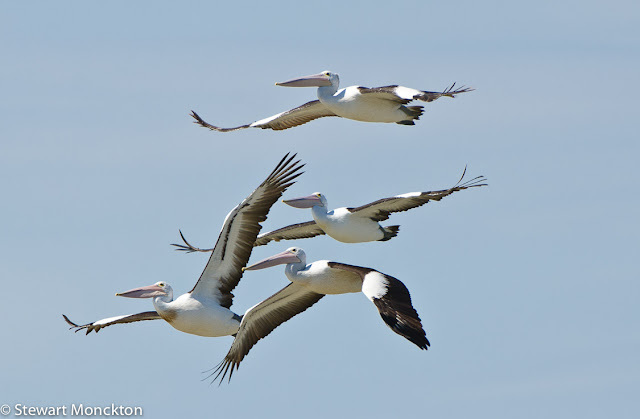 I love pelicans, but they seem sort of as if they were put together by a committee...just a little quirky and a little off (I like quirky though! )...anyway, but the ones that don't quite make the survival of the fittest must really be off. (But then again, I don't really know what's on and what's off for a pelican of course).